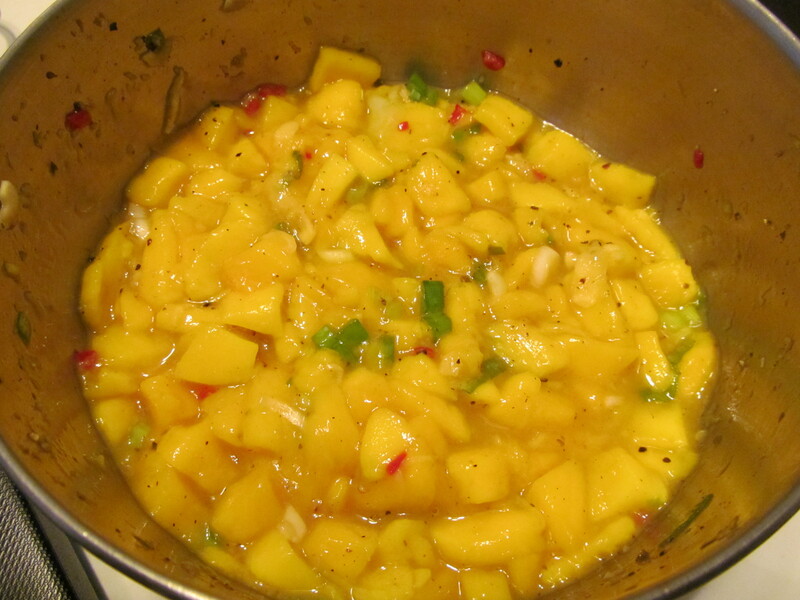 This is a simple Mango Salsa with no more than seven ingredients. I would put it on fish or chicken or if you are a seafood eater–use it with coconut shrimp, etc. See Indian, Jamaican/Caribbean, Afro-Brazilian, modern West African and pan-African Diaspora food….It is sweet meets spicy meets fruity meets umami meets tangy and fiery. If you really want to throw more Scotch Bonnet in until it sings, or omit it for a milder flavor. Just make sure you balance it out so the food you enjoy it with sings rather than mutters under too much sweetness or spiciness. Sea Salt–(I used Falksalt Red Chili salt—which is flaked Mediterranean sea salt with red chili flavors–)to taste… I love the Falksalt line–very very yummmy…rosemary, wild mushroom, chili, and wild garlic and citron–YES!!!!! Exchanges: cloves, allspice, papaya, grapefruit, orange, cayenne, serrano, red wine vinegar, apple cider vinegar, fish pepper….